SUNRISE BEACH - The smell of fresh barbecue filled the air at the Bear Bottom Resort this afternoon. 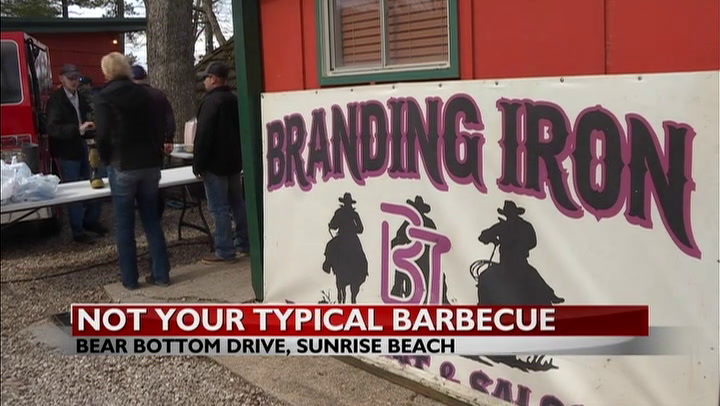 The community gathered to raise funds for The Branding Iron Restaurant’s owners after it was lost in a fire last weekend. Kelly and Laurie Preator have lived in the Sunrise Beach area for 15 years and operated The Branding Iron Restaurant for eight. On the morning of March 16, they learned the restaurant that was such an important staple in the community for years was destroyed by a fire. The Preators are well-known for giving back to the community. Every year, they serve a free Thanksgiving dinner, host a Christmas fundraiser and provide continuous support to the area’s first responders. Jake Dill, a local fireman, organized the barbecue fundraiser. After everything the Preators have done for the community, Dill says it’s the community’s turn to be there for the Preators. Dill said what started as a parking lot get-together quickly turned into a demonstration of overwhelming support from the community. The morning after he created the event page on Facebook, there were over 1,000 people interested in attending. Local firemen, Branding Iron employees, and community volunteers served food to attendees from noon to 4 p.m. Silent and live auctions also took place with items donated by local businesses and people. Dill said before the event began this morning they were expecting between 600 and 900 people to attend.